Spring begins January for Austin, Texas? In some ways it does. Every January we get several days on which the high temperature is at least 70°. Field guides cite January as the beginning of the bloom period for the anemone, so the ones I found two days ago weren’t even premature. Glorious. I don’t think I’ve ever seen an anemone treated quite this way. I’d love to see the colony! the background in today’s picture is is different from any I remember. As for the colony, I hesitated to use the word (I thought about group instead) because anemones leave a fair amount of space between plants, unlike, say, bluebonnets, which can grow in dense groups. Drift is a good word, but colony works too! Yes, and that’s why I kept with colony, which doesn’t always have to be dense. And it’s interesting that Latin plausibilis, the source of plausible, meant ‘deserving applause’. Especially because I don’t do well in the cold. That’s a main reason for my moving south from New York. It’s a great shot, and I think the background looks great, too. Yesterday I saw the forecast for your area today and felt sorry for you and Melissa. Glad you like the background, which I had my doubts about. I could’ve shown one of the more-conventional pictures I took but I decided to be adventurous. And yes, having any wildflowers at all at this time of year, now matter how they’re depicted, must seem strange. I think of anemones as being in the mountains of Europe and Asia. I would not have looked for them while in Oklahoma – or Texas. It looks like there are 6 Anemone species in California, mostly in the north, but 1 in the south. Well, it just goes to show how many of our natives we really study. We tend to concentrate on the natives, and ignore those that those who set the trends are not too keen on. I never heard of the anemones, but I got tired of hearing about the worthless calochortus! I just checked and found that all 6 are native to California. What I mean is that we tend to learn the trendy natives. When I was in school, calochortus, ceanothus, red twig dogwood and the salvias were all very trendy. We sort of discussed the coastal redwood and coast live oak. However, no one was interested in the Monterey pine, Monterey cypress, giant redwood, and certainly not the desert fan palm. It was as if they were exotic. I’m afraid no area of human endeavor is free from trendiness. For example, as a teacher, I witnessed it for decades in education. When we were in college, my colleague was always hip and trendy, and dogged me for being so plain and simple. Yet, there many things that I did that eventually became trendy; and were then suddenly cool. My colleague makes the same observation about how some very useful native plants get ignored, while other rather useless plants are all the rage. He uses California sycamore in large scale landscapes. It happens to be one of those natives that has yet to get into the cool crowd. Meanwhile, other landscape designers are still caught up with the Fremontodendron, or Fremontia, which lives for only a few years (which no one mentions) and is very difficult to prune without offending. Those are good observations from your field to support my general claim of trendiness being part of the human condition. How else to explain the hula hoop in the 1950s, the twist in the 1960s, and disco and Rubik’s cube in the 1970s? We have several species of Anemone here, but not this one. It is really pretty, and I particularly like the patchy background. I think blue sky behind it would have looked odd because it is a low grower. We are standing at -20 this morning, a record cold temperature for Chicago land, or so I understand from the news. My lively little dog didn’t even want to get out of bed this morning. So, it goes without saying how welcome this lovely flower is! Wow, that is really dramatic! I aim to please. Call it flower power. That’s a very pretty shot from behind. I planted some anemones for this spring, so far lots of leaves but no flowers. I love finding the wild ones on the hills, but it might be a little early yet. It’s the backlighting that made this anemone glow. I share your pleasure in finding wild ones, and in fact this anemone was in a hilly part of Austin. You can see that what would be early for Cornwall is right on time for central Texas. Now that’s a reaction I approve. well It really is amazing ! Good. You’ll get no argument from me about that. Yes, it must be quite a surprise for people at your latitude to think of wildflowers already coming up in January. In fact I saw another native spring-blooming species flowering a couple of weeks ago but in a place and under conditions that kept me from photographing it. Thanks for letting me know. It’s an unconventional flower portrait but it seems to work. Simply lovely capture of a beautiful wildflower. Thanks for the reminder that we need to head up into the hills to see if anything has popped open. A bit early, I would imagine since there could possibly be snow as we climb in altitude, but worth checking out. I remember being surprised in other years by the wildflowers you managed to find earlier in the year than I thought would be possible up there in Montana. Good luck in your search. That’s very pretty! What a welcome sight it must be as a preview of spring! The temperature that night dropped down into the 30s but I’ll still call this a pretty introduction to spring. I really like the play of light in the background, which provides a delightful counterpoint to the mixed colors in the flowers. I’ve seen purple anemones in the hill country, but ours tend to be a purer white. I thought this might even be a different species from ours, but then I saw that Anemone decapetala is a synonym for A. berlandieri, the name I learned. I’ve not seen any of these yet, but a friend in El Campo said they’re beginning to bloom there. The play of light originally disconcerted me because I could see all the distracting details in the background. Fortunately the camera didn’t see them as well. As for color, I did photograph one all-purple anemone and one or two all-white anemones, all from above, but this mixed-color backlit view from behind struck me as more original. And as for the scientific name, I went from memory, without double-checking the way I usually do. I’d forgotten about the name change to A. berlandieri. Buena suerte con las anémonas en el campo en El Campo. What a beautiful anemone! I like the light behind it. It’s the familiar native anemone down here. Having the sun in front of me transformed it into something special, letting light simultaneously cast shadows on and pass through the petals. Lovely enough to want to meditate upon its mood. Meditate away, Sally! May enlightenment come with the light. Spring comes early to Austin! Very clever to use the light like this, it makes the beautiful wild flower glow. Greetings from cold North Norfolk. One of the reasons I chose to live this far south is that spring does indeed come early and we don’t have much a winter. I hope your body does better in the cold than mine. Not sure I’ve ever seen an anemone wild, or perhaps I had and just didn’t know it. I’ll look from now on; they appear to be a good ‘Love me, love me not’ flower to pick. And though the glow-y portrait that the dark background makes is remarkable, I like the back-lit anemone best. Can’t believe January is over already. Where did it go? Usually for me it’s the other way around. I’ve never been a gardener, and almost all of the little I know about garden plants has been through what I’ve learned about native species here. My impression is that native anemones are common in your area, so this may be the season you tune in to them. The native anemone flowers are on the small side, so trying to do ‘Love me, love me not’ with one might take some digital dexterity. Oh, but their largess on my pocket computer screen! Guess we’ll have to wait for the spring daisies instead. I’ll keep a keen eye out for them on our daily walks. Ah, relativity. I wonder if any of the people at your nearest Native Plant Society chapter could point you to specific places where you’re likely to find anemones. Great idea. I’ve got a call into them about something else: building a pocket prairie. I’ll add the anemone to my already long list of questions. 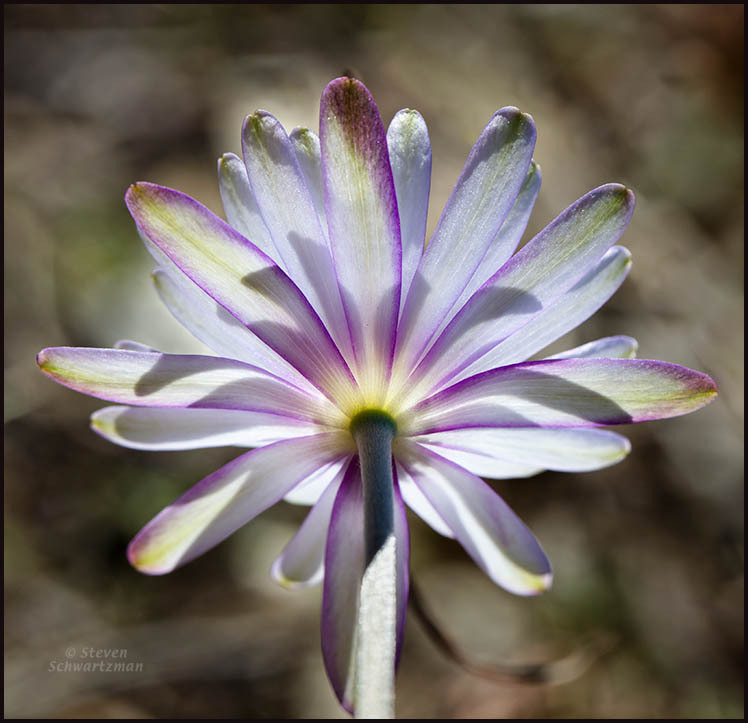 A clarification: in both of the anemone portraits, the light came from in front of me and passed through the flower. An excellent image – what a beautiful thing to find in January! It’s quite an unusual January sight for those of you up north. I’m glad to brighten your winter. Some flowers look just as lovely from the back as you have demonstrated. It will be a while before I can post the same title. Actually I began seeing a few truly spring wildflowers a couple of weeks earlier but for various reasons ended up not photographing any of those. And yes, this one worked quite well as a portrait from behind, especially given the light in front of me. How exciting that you found the first spring flower, Steve. The light effects on the petals are as beautiful as the blossom itself. At first I was dubious but I soon came to appreciate the play of translucence and shadows. In replies to earlier comments I mentioned having seen (but not photographed) other native spring wildflowers even earlier in January. We’ve had a mild winter, even by Texas standards. No need for “dubiosity” (I know this is not a word, but it should be one), Steve. The flower emanates a beautiful light. I recently learned from a blogging friend in Northern Germany that spring flowers are making a far-too-early appearance. Like many other natural phenomena, it is a disconcerting sign. While less common than dubiousness, dubiosity keeps a Latin-derived suffix on the Latin root of the word rather than adding the native English suffix -ness. And yes, the light emanating from the translucent petals is appealing. I am so glad to stand corrected, Steve. My reference source did not list it, but I simply love the ring of that word. Seriosity is definitely frowned upon in this play. Ah, but one person’s frownity is another person’s smilitude (which of course differs from similitude). Smilitude is the preferitude (I like contractions, too).